Guys, I created this thread for everyone out there who wants to calibrate the color of the screen of ZUK Z2. It is really based on preferences, but at least let us try to see whose settings are more preferable and pleasing to the eyes. PS: If someone has a better color calibration setting, please share your ideas, as this calibration is not limited to just one preference. EDIT: set Livedisplay Daytime to 7000k and the blueniss is gone. Good that you brought it up! 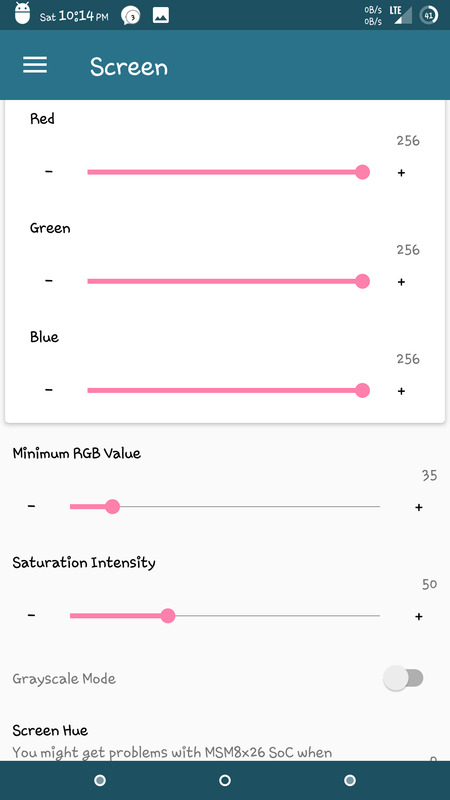 I tried playing with the settings in kernel auditor as well but it is impossible to calibrate the colors the same way as stock ZUI by using kernel aud. I tried your settings but that makes all the colors 'pop'. Does anyone have an idea how to get stock screen colors on cm13 based roms (except basic kernel auditor settings)? Yeah. My settings isn't good. Ahahaha. Will try to update it. Since every phone has different ips lcd panel, Im really having a hard time to get a basis from other units. Whatever I would like to set up not getting a true white. Hi, what app can I use to calibrate the screen? Thank you, one more question, my phine is rooted, but os is stock, can I do it with stock kernel? I have new screen tweaks. Will update later. Tell me the settings by which my display look like mi 5, mi 4c.